The states oldest and largest wine festival. Held annually at The Plains. Includes ticket information, a winery list, and lineups of music, activities, and restaurants. Popular American publication covering culinary and vinous topics. Wine section features informational articles, interactive food pairing, and a wine search. Offering free content such as a directory, wine tasting 101, and food and wine articles, as well as wines and wine-related products for purchase. Annual spring festival featuring wine and food pairings, and the Rising Stars Chefs Awards. A premier wine E-zine. Focus on wine education, value priced wines and wine-food combinations. Extensive tasting notes archives and active forums with worldwide participation. Offers wine appreciation courses (including WSET). Also organises wine tastings, cookery courses, corporate events, wine tours and catering. A blog which details of the journey through my food and wine adventures. Contains wine reviews, stories and recipes. Consumer wine and food online magazine spotlights US wine. Wine, food and accommodation in one of the Hawkesburys oldest buildings. Produces wine from the area and from other wine regions around Australia under separate labels. Focused entirely on food - eating, drinking, cooking, consuming, as well as obsessing on food, wine, recipes, restaurants, and yumminess. A quarterly magazine focusing on wine from Australia and New Zealand. Wine and food adventures in San Francisco and around the world. Food and wine festival in Houston and Galveston, with tastings and vintner dinners. Includes ticket information and exhibitor lists. Wine from both the classic European varietals well as more obscure grapes, and pairs wine and food at their cafe. A Hunter Valley vineyard offers information on wine and food, wine and health, and a vintage chart. Searchable wine notes archived from the alt.food.wine usenet group and others. Offers guided food and wine tours of France and Italy. Contains a sample itinerary and customer testimonials. Hundreds of wine tasting notes as well as gourmet food adventures by a serious Burgundy buff from Israel. Wines of the month, tasting notes, Boston Wine Expo reports and 'The Unofficial alt.food.wine Punt FAQ'. South Australian winery tells of its vineyards, wine style and history. Also offering food service in the wine shop. Offers classes and tastings in and around London, UK. Includes course descriptions and schedules, reviews, and reports from trips to wine regions. Companion site of a Kansas-based radio program that has food, wine and travel information including cookbook and wine reviews. Answers common questions about pet food so pet owners can make an informed decision on what to feed their pet. Contains interactive pet food labels so consumers may learn more about is in their pets food. Features reviews, a glossary, tasting instructions, descriptions of wine types, discussion forums, and food and wine pairing information. Society of wine and food enthusiasts. Includes information about membership and wine judging competetions, as well as tasting notes, articles, and event listings. West Virginia University researcher suggests that one to two glasses of wine with meals may help wipe out bacterial food contamination. John McNulty hosts this online version of his popular Philadelphia wine radio program featuring a live feed, quarterly newsletter, wine and food articles. The Meyer family runs this historic operation producing all the classic wine varietals of the Alsace. Features tasting notes, wine and food information and a photo album. Annual festival held in September in Atlanta, featuring over 300 wines, food samples, wine-related artwork, and live music. Includes information for exhibitors and visitors. Held at the Cincinnati Convention Center, this is one of the Midwests largest annual wine and food events. If the business hours of Vintage Virginia in may vary on holidays like Valentine’s Day, Washington’s Birthday, St. Patrick’s Day, Easter, Easter eve and Mother’s day. We display standard opening hours and price ranges in our profile site. We recommend to check out vintagevirginia.com/ for further information. 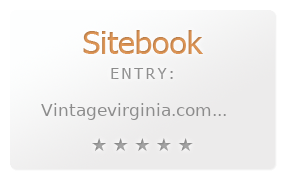 You can also search for Alternatives for vintagevirginia.com/ on our Review Site Sitebook.org All trademarks are the property of their respective owners. If we should delete this entry, please send us a short E-Mail.